It’s excellent to see something that you’ve watched building from behind the scenes finally make its way out into the world. Most definitely too exciting, because I accidentally leaked the site details before it was fully polished… I was just too thoroughly happy to buy the first shirt. Past and Prologue is a British-based clothing store specialising in intelligently designed Shakespeare merchandise. Imagine the sort of things you could buy for any number of pop culture icons, and now realise the dearth of those celebrating Mr Bill Shakes. 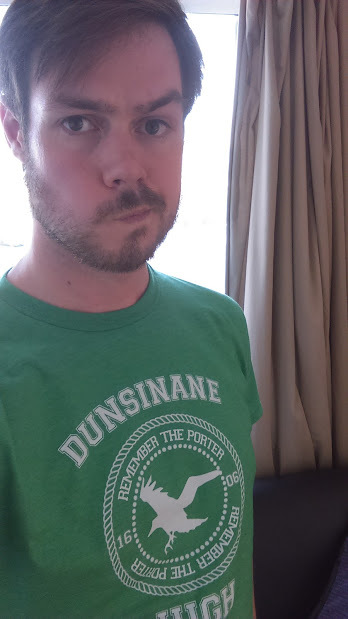 Not all of the designs have such inevitable puns as the Dunsinane Varsity tee; there are some beautiful & elegant works with typography & frontispieces, and also some excellent watercolour character pieces from the talented Nathan Tubb (or Baboonicorn as he is more animally known). But it will always be the puns that draw me in. Fully disclosure: I am rather close with P&P’s owner. Not only should you buy the things because they are great, but also it means we can go on more pretty dates.